We’re a year older again. Not that I’m complaining or anything. But it’s all your fault. The blog started as a small exercise for us, perhaps with a view to build something else in time, a site to serve a purpose that we don’t even care to remember now. Instead, we managed to gather a great community around our little place on the web. Industry peeps, whisky lovers and random googlers made us carry on as a non-profit blog by clicking their way here and making us feel busy and important. Thank you. The road you made us go down, turned out to be the right one. 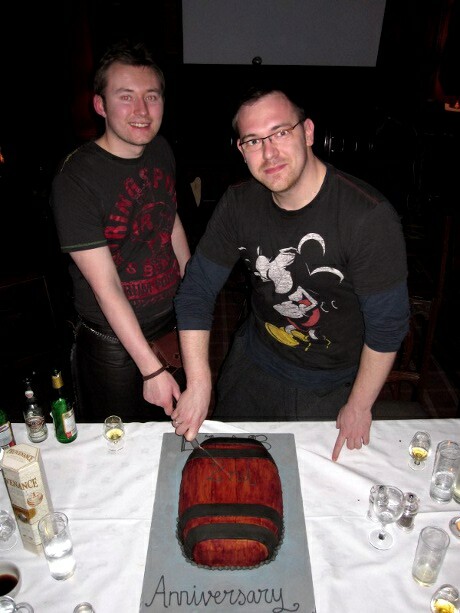 We never looked back and we can’t imagine our lives without Edinburgh Whisky Blog now. On Wednesday we celebrated our blog’s 2nd birthday and many of you showed up at the SMWS to share a dram or two, stuff your faces with cake and show support. Again, big thanks. We failed to do a head count but we feel there were about 70 of you there for us. Any more and the SMWS staff would actually cry and run. Cheers. I am not bothered going into detail and describing the event for those of you who missed it. All I can say is that we had a blast and that it was bigger and better last year so make sure you keep 12th of January clear next year and… well… for the rest of your lives. My personal fav moments were chocolate and whisky matching with Coco Chocolate‘s the fantastic Kristina and Kirsten and Death Trap City‘s mini unplugged gig (Craig, Michael and Richie – you rock! At Sweet Child o’Mine you had me wet.). While I’m on mentioning the awesomest people who made it happen, big Mexican wave from Chris and myself to Howie and Sarah at 21st Century Kilts, Lali-the-cake-maker, Paula-the-cookie-baker and of course Nick and the team at the Society. Also, from me personally, big ‘ta’ to Chris who pulled all this together with very little help from my lazy person. So yeah. Here is to another busy year! Keep reading us and we will keep drinking all that great whisky and going all those ridiculous places for you. This entry was posted	on Friday, January 14th, 2011 at 10:35 pm	and is filed under Events. You can follow any responses to this entry through the RSS 2.0 feed. Responses are currently closed, but you can trackback from your own site.